This is just one of the many recommendations in a new report published by the Department of Agriculture. A REPORT INTO the Irish greyhound industry suggests that financial issues could be helped in part by using stadia for film sets, launches and conferences. It also recommends that there should be stricter sanctions for people who are found to be abusing greyhounds, and that the Irish Greyhound Board (Bord na gCon) needs to address its underfunded pension pot. 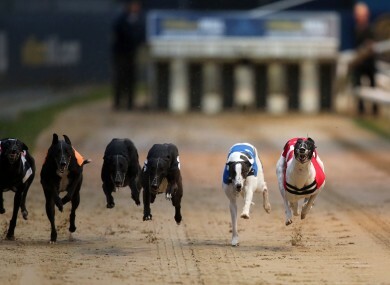 The greyhound racing industry is estimated to be worth more than €0.5bn to the Irish economy. The report, A Review of Certain Matters relating to Bord na gCon, was prepared by Indecon and published by the Department of Agriculture. 2006 in most categories of turnover”. This was reflected in an overall decline in revenue from €63.5 million to €28.2 million in 2013. The scale of the decline is dramatic and represents a fall of 55.6% over the period. The rate of decrease has since slowed. In 2006, tote receipts were just over €50 million – by 2013 they were €20.9 million. In addition, since 2007, there has been a decline in sponsorship income by €1.219 million. Meanwhile, the Bord has an “underfunded” pension plan. The report found that the main concern is that existing revenue “is not sufficient to support the level of current activity in the sector and to commence the repayment of debt”. This will require a reduction in the number of race meetings and prize money at selected stadia. The report identified that as of March 2014 there were no legal, veterinary or marketing experts on the Board. “These gaps are noteworthy given the regulatory and animal welfare role of the Board,” said Indecon. It recommends that off-track testing for prohibited substances should be implemented. The number of positive tests is less than 1% and declining, but the number of positive tests “is of concern”, as are the delays in publishing findings and the gap between positive results and adverse findings. Indecon said that the present legislation, regulations and processes for provision of integrity services in the greyhound industry should be enhanced. The report said that that the existing Bord na gCon sanctions regime should be strengthened in fundamental ways to become both a stronger deterrent to animal cruelty and as an effective sanction against those who would still offend. The range of sanctions available should be expanded and should be applied proactively. Among the recommendations is for the Bord to reduce the number of races at poorly performing stadia to sustainable levels. Look at alternative sources of income at stadia – including using them for product launches, conferences, film sets and recreational and sporting activities. A specific additional breeding incentive should also be considered by Bord na gCon, said the report. And once its debt is reduced and surpluses generated, additional prize money should be provided. Minister Tom Hayes said that he will make the necessary legislative changes required to implement a number of the recommendations as a matter of urgency. Bord na gCon welcomed the report, calling it “a thorough and independent review”. It said it will now consider the report and its recommendations, with a view to putting in a plan to address the issues raised. This plan will be submitted to the Minister within the three months. The board believes that the report “can make a very significant contribution to a re-energising and restructuring of the greyhound industry”. It said it hopes that the report will be a “defining moment for the industry” and will facilitate closer working relationships with all stakeholders. Email “Hiring out greyhound stadia as film sets could help the industry's money woes”. Feedback on “Hiring out greyhound stadia as film sets could help the industry's money woes”.